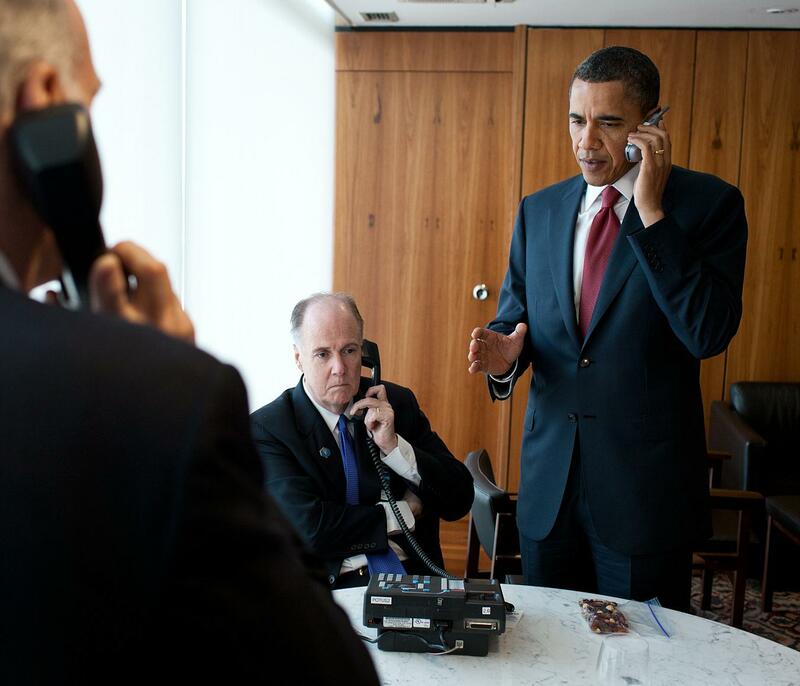 President Obama using a Sectéra Wireless GSM Phone, March 19, 2011. The picture shows president Obama giving the final authorization for the United States Armed Forces to begin a limited military action in Libya, in support of an international effort to protect Libyan civilians. This call was made during a short visit to Brazil. 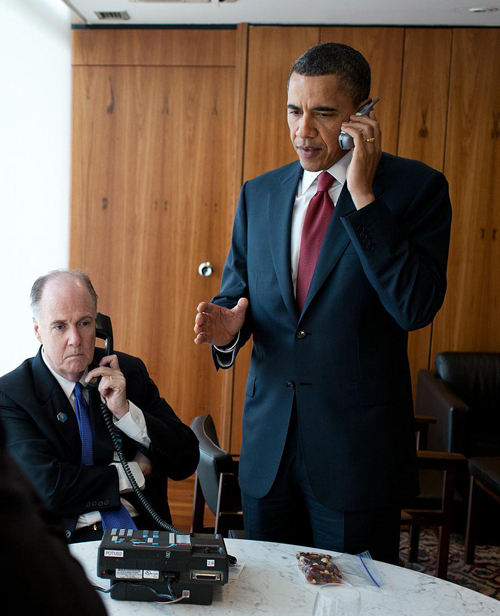 Sitting next to Obama is his National Security Advisor Tom Donilon, using one of the two secure STE desk top telephone sets, which are always standing by in case the president has to make a phone call. As can be seen in the bigger picture, the other STE phone seems to be used by another official, so probably for convenience, Obama was given the secure cell phone to participate in this conference call. In the previous post we saw that ordinary mobile phones offer only limited protection against eavesdropping. Therefore, special devices are designed to keep conversations safe. Here we will list a range of mobile phones, which offer a high level of security and are therefore suited for top level telecommunications. The following information is gathered from the internet, only to provide a general overview. For more information, provided by the manufacturer, please click the yellow section title or the fact sheet. - Produced from 2002-2012 by the American company General Dynamics Corp.
- For GSM and GPRS networks. - Ordinary Motorola Timeport GSM phone, with a special Security Module attached at the back side of the phone, replacing the battery cover. - Encryption with US Type 1 and approved Suite B (including AES and ECDH) encryption algorithms. - There are slightly modified modules for the UK, Canada, Australia and New Zealand. There's also a version, using the AES algorithm only, which is exportable to other countries. - The price of this phone is 2.095,- US dollar. > As of 2013, General Dynamics replaces this phone by GD Protected, a platform for securing high-end Samsung and LG smartphones. - Produced since 2005 by the Swedish company Sectra AB. - For GSM and UMTS networks. - This is a personal encryption device, which is connected in between a headset and an ordinary mobile phone (via Bluetooth). Voice data are encrypted by the device, before going into the non-secure telephone. - Two factor user authentication with SIM-sized access card and PIN code. - Approved in the Netherlands, by the European Commission and by NATO for conversations up to the level of SECRET. In 2011, the Tiger XS was used in 17 European countries. - Produced since 2012 by the Swedish company Sectra. - For GSM, GPRS, EDGE and UMTS networks. - Custom made mobile telephone with TEMPEST verified design and tamper response, providing Red and Black interfaces for secure and non-secure connections. - Approved in the Netherlands for conversations up to the level SECRET (STG GEHEIM), approvement for the European Union and NATO is pending. - Produced since 2008 by the German company Rohde & Schwarz GmbH. - This is a separate encryption device, which is connected in between a headset and a smart phone (both iPhone and Android) with Bluetooth connection. Voice data are encrypted by the device, before going into the non-secure telephone. - Approved in Germany for conversations up to the level of RESTRICTED (Verschlusssache/Nur für den Dienstgebrauch). - The device secures the key exchange with a 384-bit key ECC algorithm and encrypts the voice data with AES, using a 256-bit key. - Produced since 2008 by the German company Secusmart GmbH. - For GSM and UMTS networks. There are separate solutions for voice, SMS and e-mail communications. - Common high-end Nokia phones are secured by a tamper proof chip on the format of a microSD Card, which is inserted in the memory card slot of the phone. - Approved by German, Dutch and NATO agencies for conversations up to the level of RESTRICTED. - Communications are secured by 128-bit AES encryption and keys are exchanged using the Elliptic Curve Diffie Hellman (ECDH) protocol. - This solution was implemented for securing voice communications of the German federal government in 2009, including those through the Nokia 6260 Slide phone of chancellor Angela Merkel. > Secusmart provided a similar security solution for the BlackBerry 10 smartphones, which became available for German government officials in 2013. See: How secure is the Merkel-Phone? - Produced since 2008 by the French company Thales Group SA. - Custom made handset, with a second display, showing whether the call is secure or not. - Approved in France for conversations up to the level of SECRET (Secret Défense). - The price of this phone is said to be around 1.500,- euros. - Produced since 2009 by the Italian company Telsy S.p.A.
- Custom made telephone handset, with proprietary hardware and software design. - Encryption with AES, using 256-bit keys and asymmetric ECCDH key exchange, or, on demand, proprietary and custom made algorithms. Interoperable with CryptoPhone equipment. - Also sold by the Scottish company Bridge Systems Ltd.
- Produced by the Swiss company Omnisec AG. - For GSM, EDGE and UMTS networks. - Common HTC smart phone with hardened Android operating system. The encryption engines are stored on a single chip, which is inserted into the phone like a SIM-card. - Encryption with Omnisec proprietary algorithms using 256-bit keys. - The price of this phone is said to be around 25.000,- Swiss franks (although 2500,- franks seems te be more realistic). - Produced by the Swiss firm Crypto AG. - For EDGE and UMTS networks. - Common high-end Nokia smart phone from the E-series, with Symbian operating system. The crypto capabilities are provided by a single tamper proof chip (the Crypto Mobile HC-9100) on the format of a microSD Card, which is inserted in the memory card slot of the phone. - Encryption with a customer specific cipher algorithm HCA-820, using 128 or 256-bit keys. - Produced since 2012 by the British company IntSec Ltd.
- Encryption with AES, using a 256-bit key, which is exchanged via 1024-bit RSA. - The price of this phone is 1.320,- pound sterling. - Produced by the German company Gesellschaft für Sichere Mobile Kommunikation mbH (GSMK). - Customized HTC mobile phone, with the operating system being a stripped down version of Windows Mobile. There are various other models available. - Encryption with Twofish and AES in parallel, both with 256-bit key length, exchanged using a 4096-bit key Diffie-Hellman algorithm. - In 2001, the Dutch hacker and digital rights activist Rop Gonggrijp started to work on highly secure phone, which was eventually launched in 2003 as the CryptoPhone 100. - For the United States, the GSMK CryptoPhones are manufactured and sold by the Las Vegas based company ESD America Inc.
- The price of this phone is 2.618,- euros. Some other, predominantly commercial secure mobile voice solutions are also provided by companies like SecurDigital in the US, Nabishi in the UK, PrivateWave from Switzerland, CasperTech from Italy, GeeksPhone from Spain, SecurStar from Germany, Compumatica from The Netherlands, and Gold Lock from Israel. Encrochat is also a highly secured and customized cell phone, made by a small company from Canada. All these phones use a hybrid cryptosystem, in which the conversation is encrypted with a very strong symmetrical cipher, often AES with 256-bit key. This key is then encrypted with a public-key cryptosystem, like RSA or ECC, and transmitted together with the encrypted message. Only the intended recepient can then decrypt the key and henceforth the message. By this method, end-to-end security all the way through the public telephone network is provided. The most secure mobile phones are made by defense contracters, often primarily for being used by national government and military officials. This is because using telephones, or any other communication device, made by a foreign company always bears the risk of secret backdoors, allowing easy access to the encrypted conversation. Countries, and also international organisations, without their own production facilities for military grade encryption equipment often go to companies in small or neutral nations, where they expect to have the least damage in case there would be a hidden backdoor. Another inevitable risk of mobile phones is using them in (public) places where conversations can easily be overheard by other people or by listening devices. Secure wireline desk top phones can counter this threat by installing them in rooms which are secured against eavesdropping. This is also one of the reasons why conversations at the highest level (TOP SECRET/SCI in the United States, TOP SECRET elsewhere) are often restricted to dedicated wireline circuits only.